I recently asked my Dad for his memories about the moors around Sheffield for my new book The South Yorkshire Moors. I was interested how his experience of the moors growing up in Greenhill in the 50s/60s compared to mine growing up in Oughtibridge in the 80s/90s. Though on opposite sides of the city, the moors were accessible from both if not right on the doorstep. Here are his recollections, followed by thoughts from my own childhood. "Growing up on the south side of Sheffield, I was never very far away from the moors. My family didn’t have a car at that time (1950s) but in the summer we used to catch a bus to Foxhouse to picnic by the stream there. 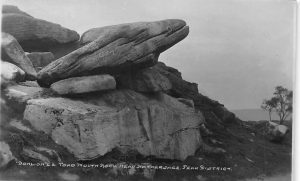 The rock formation known as Toad’s Mouth always held a fascination for us as children, mainly because of the name I suppose but it was good for clambering on, as I remember." "Sometimes we’d catch a train out to Grindleford and walk up Padley Gorge. That was always an exciting trip, as the train had to pass through Totley Tunnel, the longest in Britain, I think and that would take around four scary minutes of darkness. The gorge stays in my mind because we were always scared of coming across ants’ nests among the bracken and gritstone there." "Another place we’d go in high summer was Totley Moss, which was particularly good for picking bilberries." 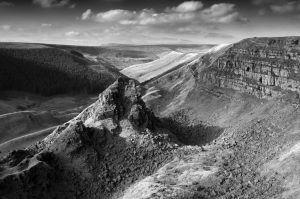 "Very occasionally, we’d take the train out to Edale but rather than venture up onto Kinder Scout, we would go over Edale Cross to Mam Tor and the Castleton caverns instead. 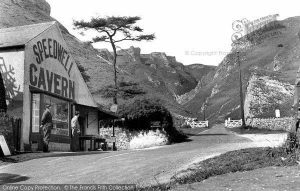 We particularly liked Speedwell Cavern, as you went in a boat along a very low and dark tunnel." "A little later when we had a car, we’d drive over the Snake pass to visit my aunt and uncle in Manchester. With its notorious winding road, this also was quite an adventure for me and my sister, although once again, part of that was due to its somewhat sinister name." As for me, my first memories of the moors were Sunday walks. Dad would drive us out to Strines, Langsett, Ladybower or Redmires and we’d hike up onto the hills for half the day, then come back for Sunday lunch. He told us about the nesting birds we saw squawking angrily as we passed and about all the trees we saw, and we’d forget it all by the following week. In summer we swam in the streams and in winter we jumped in bunises (a term we made up for deep pockets of snow that stayed long after the rest had melted). In late summer we picked bilberries as Dad had done in his youth and returned with bloodied hands. 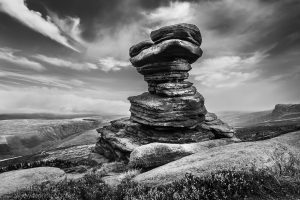 Our favourite walks were not original - the Great Ridge, Win Hill and Derwent Edge, the latter because of all the fabulous names for the rocks along it (Salt Cellar, Dove Stone, Cakes of Bread, Wheel Stones) - but a great introduction to the drama of the Peak District. Back Tor was the closest peak to home and we did a lot of our walking around Strines and Bradfield. Later I began venturing out to the moors on my own or with friends. 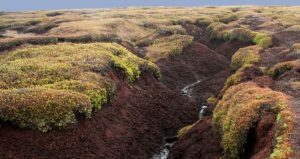 This is how I explored Kinder Scout and Bleaklow for the first time, marvelling at the alienating landscape of bare peat and myriad groughs. 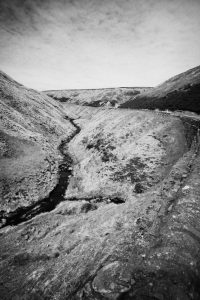 I had long wanted to cross the Kinder plateau and remember heading tentatively upstream from Kinder Downfall, then following stream after stream until there was eventually not enough of a channel to walk in. Popping out of the groughs for the first time, I was presented with a remarkable sight - the landscape looked the same on all sides. There were no view, no landmarks and no sense of direction. I followed the compass south-east to the opposite edge of the plateau, whose rocks soon offered more of a panorama, but I loved those moments of disorientation. Just 10 miles from home, this landscape felt truly wild.